Many fast food employees across New York State and some cities nationally are or will soon be earning $15 an hour, and it’s quite the hot topic fueling many debates. I will simply share my own experience: I worked part-time throughout college, juggling school and jobs, making $3.10 an hour (about $7.60 today). After graduating with a 4.0 GPA in May 1982, I got a full-time job as an underwriter at a health insurance company. My starting pay (with a college degree) was $5.75 an hour, which is $14 an hour today. But let’s talk about something else besides what the person who builds your Big Mac is paid for doing so. Because there’s a serious issue with a very steep price tag associated with fast food, and it affects people EVERYWHERE. HIGH fat (not the good kind), HIGH sodium, HIGH refined carbs, HIGH preservatives and chemicals and LOW nutrition. Talk about a recipe for health disasters of epic proportions. When you take in truckloads of calories and get little or no nutrition in return, an interesting phenomenon occurs. Your hunger signal is triggered by a need for nutrients, and since fast food doesn’t nourish you, it won’t be long before you’re hungry again. Plus the refined carbs in fast food are very addicting, so you’re likely to reach for more fast food when you do feel hungry. All the while the calorie tally continues to soar, you never get properly nourished and the weight keeps piling on. Fast food meals high in refined carbs cause a surge of glucose into your bloodstream and clang the alarm for the pancreas to secrete insulin. If this happens repeatedly, eventually your cells can get saturated with glucose, they’ll ignore the insulin (called insulin resistance) and ultimately glucose can build up in the bloodstream resulting in Type 2 diabetes. Fast food can lead to heart disease in three different ways! First, the glucose building up in your bloodstream from fast food can stir up inflammation in your arteries because sugar is a very abrasive, destructive substance. Eventually this can cause damage to the inner artery walls, creating “hot spots" where plaque can begin to build up. Second, the high sodium content in fast food causes your body to retain water. Over time your blood volume goes up and so can your blood pressure. 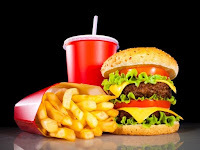 Lastly, the trans-fats in fast food spur the development of free radicals which damage your arteries (as well as accelerate the aging process and make you look far older than your years). The inflammation stirred up by excessive glucose in the bloodstream can give a signal to tumor cells to multiply—especially cancer cells. Plus sugar feeds the harmful bacteria in your gut, creating an unhealthy gut flora environment known as dysbiosis. Since 70 percent of your immune system resides in your gut, and your immune system protects you against cancer, eating lots of fast food and upsetting the gut bacteria balance can eventually weaken your body’s primary cancer defense. Your brain needs nutrients and good fats, and when it doesn’t get what it needs, depression can result. A study published in the journal Public Health Nutrition showed that people who eat fast food are 51 percent more likely to develop depression than those who eat little to no fast food. It was also found that the more fast food they consumed, the more likely study participants were to develop depression. Lacking these vital nutrients can also cause cognitive impairment. Not only are the numerous chemicals and preservatives in fast food linked with a variety of cancers, learning problems, gastrointestinal issues and endocrine problems (thyroid and hormones), but they also stress your liver. Your liver is your main organ of detox, and contrary to what you may believe, the chemicals in fast food don’t just innocently cruise out of you—they have to be detoxed like a poison by your liver. In addition, the excessive amounts of sugar in fast food (especially high fructose corn syrup) puts a tremendous strain on the liver because the liver must metabolize 100 percent of the fructose you take in (but only 20 percent of the glucose). Plus fructose metabolism in the liver drives up uric acid production which can lead to gout. If you want a disease-free life, not having to depend on medications just to get through your day and maintaining a normal, healthy bodyweight, stay far away from the golden arches (and all the other junk joints too). Instead feed your body the REAL foods it needs to create a stronger state of health and a slimmer you! The Great Taste No Pain health system will give you the all guidance you need. Great Taste No Pain teaches you what foods to eat (and what foods to pair together) to help keep digestion smooth, nutrient absorption high and acid wastes low. Plus it's loaded with delicious recipes featuring healthful REAL foods that you'll absolutely LOVE. Note: If you have a known or suspected gluten sensitivity, I've got you covered with Great Taste No Gluten. The friendly bacteria in your intestinal tract help to keep the gut wall strong and non-porous, as well as assist with digestion, keep harmful bacteria under control and support your immune system functioning. The ideal flora balance is having at least 85% beneficial bacteria and no more than 15% harmful. The problem is many people are walking around with the complete OPPOSITE of what they should have—and this is especially true of people who eats lots of fast food. So it's important to give your gut a helping hand with a quality probiotic supplement like Super Shield multi-strain probiotic formula. Super Shield contains strong, effective strains of 13 friendly bacteria that can help fend off harmful bacteria, encourage smooth digestion, support your immune system and help make the gut wall nice and strong (so toxins and wastes can be safely eliminated and not reabsorbed into your system). See how great YOU can feel when you say goodbye to fast food and hello to the right diet and a healthy gut environment! What an absolutely important article this one is, Thank you for highlighting the common issues and diseases associated with fast food. Very well written and explanatory piece.